V ital Link offers repair services for all currently fielded engine test enclosures including IDIQ for USAF, legacy and obsolete gear. 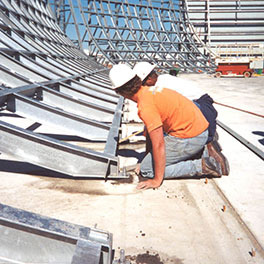 Repairs can be conducted at Vital Link’s facility or on-site at the customer’s location. We have field service teams ready to make site surveys worldwide. Initial phone consultation with Vital Link technicians can provide remote troubleshooting, as well as guidance on any evaluation of the enclosure or equipment needing repairs. Where pre-repair evaluations are conducted, repairs are not undertaken until evaluations are transmitted to our clients, repair options priced and approved client instructions are received. Obsolescence and future serviceability are considered in our evaluations and repairs. As we repair items, we try to overcome sourcing problems and restore function through incremental technology refreshment. This process aids our customers in operation of their older equipment in a high-tech world. Sustainment is a key at Vital Link. Vital Link is the USAF’s IDIQ contractor for Hush House repairs, refurbishment and relocation services. Fire Suppression Systems have been added as a new tasking category for 2018 and beyond. Hundreds of repair & refurbishment projects have been completed for the USAF and ANG, including multiple simultaneous repairs. VLI has refurbished & relocated over thirty (30) Noise Suppressors/Engine Test Cells including T-4s, T-8s, T-9s, T-10s, T-11s, T-12s, and USN Aircraft Acoustical Enclosures. Fire Suppression System repairs have been added as a new component of IDIQ tasking. Sustainment is very important at Vital Link. We understand the need for equipment refreshment and life cycle cost savings. We have FSRs dedicated to keeping the USAF’s Hush Houses in working condition. Atec is USAFs IDIQ contractor for test cell stands, control systems and equipment. Celtech has worked in military engine test systems worldwide and NETS, which is the former Astronics Engine Test Systems, has an IDIQ contract for JETI, SETI, TPTI and related engine test systems with the US Navy. On-site repairs can vary depending on the state of the equipment and complexity of the repair. These require coordination with Field Services & Engineering. Please contact Vital Links for the initialization of a field repair, or get urgent assistance via our 24/7 hotline 1-877-514-2218. Now as part of the Atec team, we offer the enlarged resources of Celtech, VLE, NETS (formerly w/Astronics) and Atec to our customers worldwide. Vital Link has sixty-five (65) experienced technicians on up to 8 teams who can respond quickly to a site service call. From troubleshooting to executing minor/major service repairs, Vital Link’s field personnel are ready to survey or inspect your equipment to determine the issues. Review of all material records, work reports, processes, and in process inspections, etc.